I mentioned in my post about the Hole in the Wall food tour that SPAM is ubiquitous in Hawaii: supermarket staple and a beloved part of local cuisine, it’s eaten in heroic quantities (over 7 million cans per year). Although there’s always SPAM in our pantry at home, on our Hawaiian holiday last year, SPAM was high on my agenda. 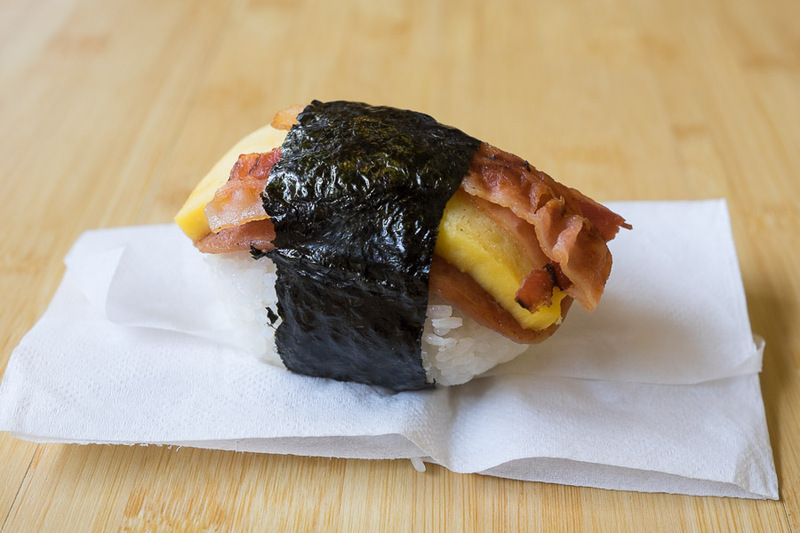 Jac is nowhere as crazy about SPAM as I am but she’s a good sport and didn’t object to lunch at a Japanese cafe in Waikiki that specialises in SPAM musubi (fried or grilled sliced SPAM served on a block of rice, wrapped with nori). 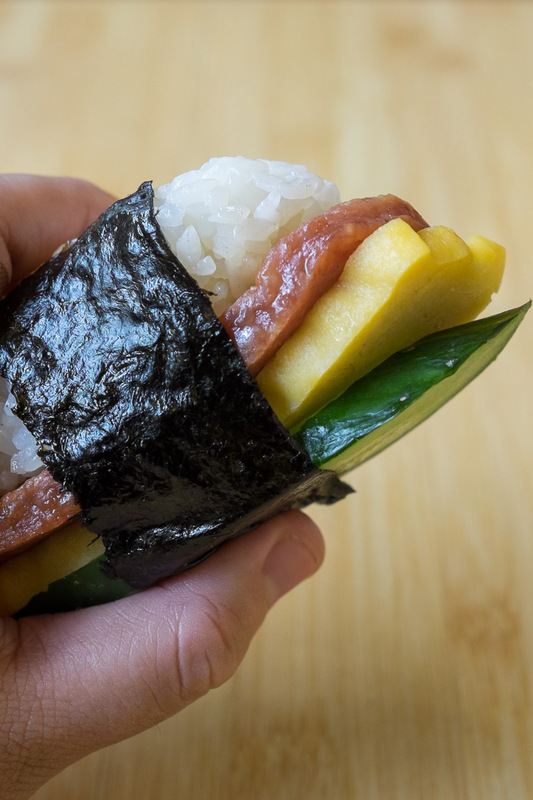 I ate SPAM musubi in Perth just once, and the mistake they made was serving pre-cooked, fridge-cold SPAM in the musubi. 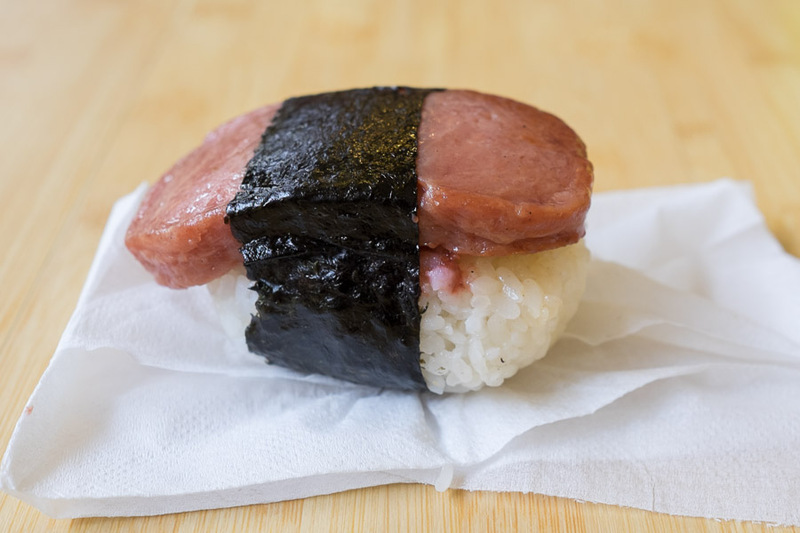 In Hawaii, SPAM musubi is a popular snack and can be found prepackaged for sale in convenience stores. 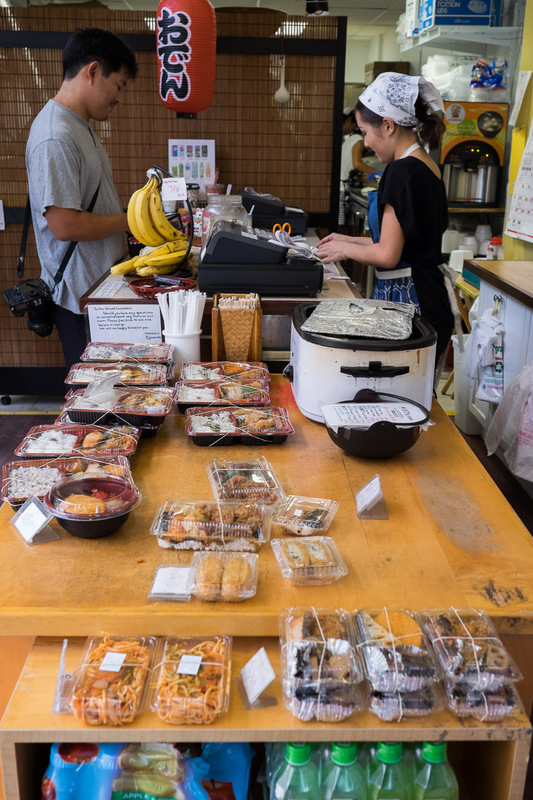 At Iyasume, the SPAM musubi are made to order and arrive in little cling-wrapped bundles, the SPAM and rice warm, the musubi surprisingly substantial. 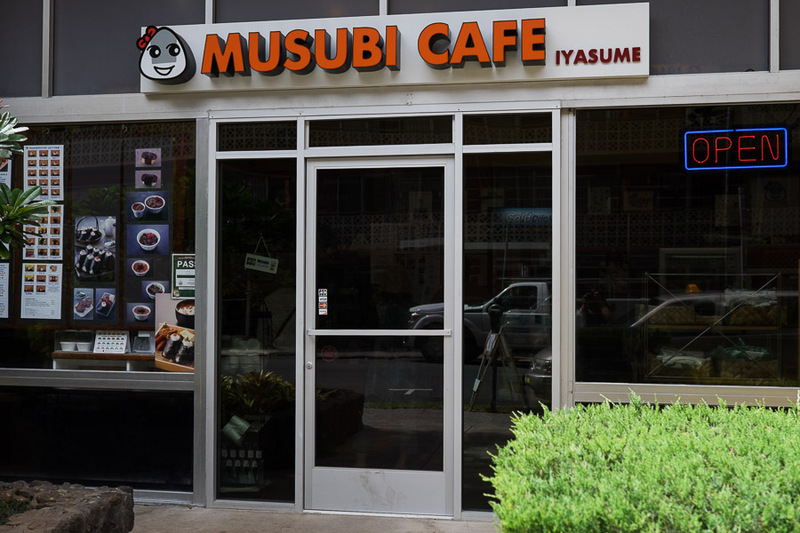 If I lived in Honolulu, I imagine I’d be a regular customer of this cute cafe. 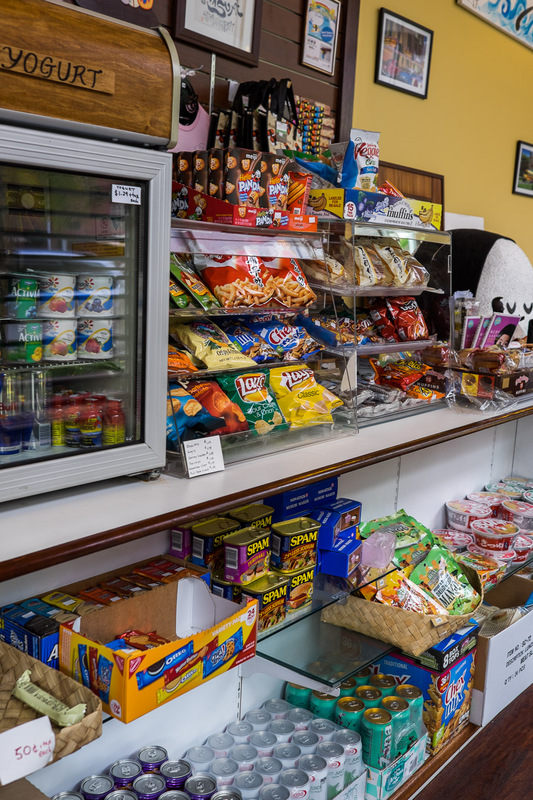 There are takeaway meals for sale on the front counter. 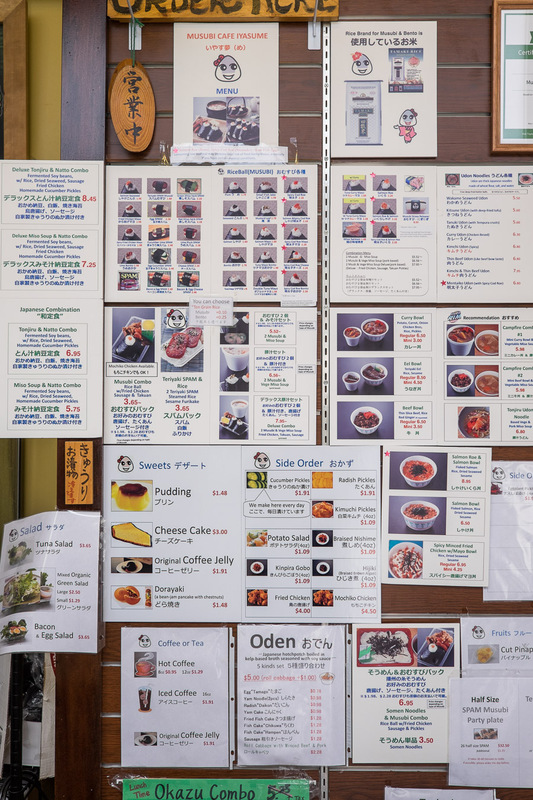 The mind-boggling wall of menu! The cafe sells more than just SPAM musubi and if we’d had more time in Honolulu, I’d have liked to come back for another meal. SPAM, egg and cucumber (US$2.48). SPAM, egg and bacon (US$2.48). SPAM and bacon, two of my favourite things! Plum SPAM (US$2.28). The extremely sour plum and salty SPAM are a challenging flavour combo and won’t be to everyone’s taste. 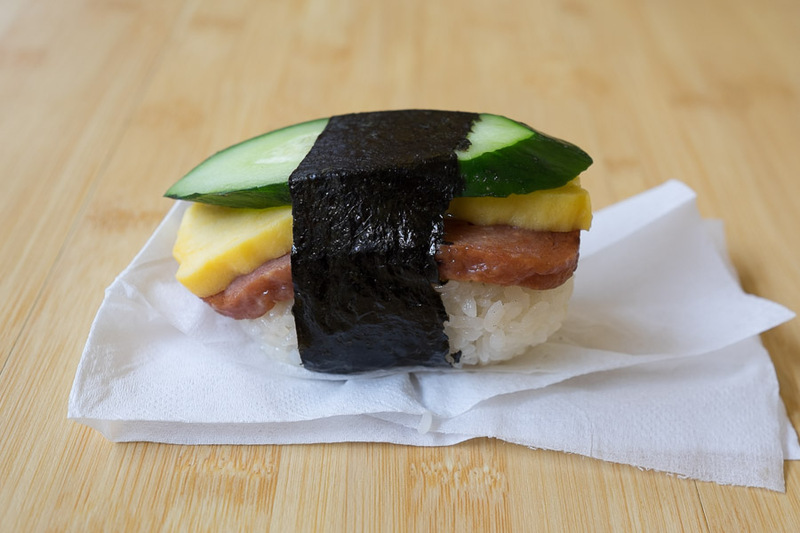 Salty SPAM, sweet tamago (egg) and crunchy cucumber – the most balanced combination and my favourite of the bunch. Jac also chose Cheese SPAM (US$2.28, not pictured), with startlingly yellow stretchy cheese. There’s a selection of groceries for sale (mainly snacks and convenience foods) and of course, tins of SPAM. 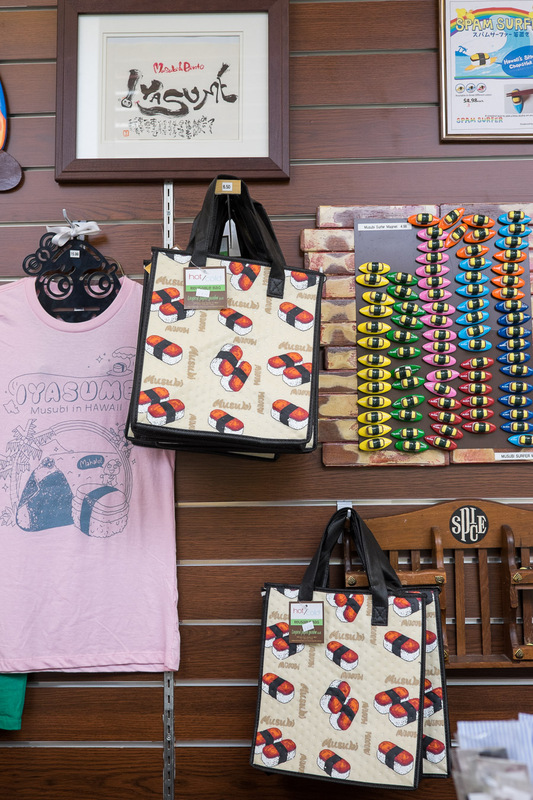 There are SPAM musubi-related souvenirs for sale too. I’d have bought a T-shirt, but pink hasn’t been my colour since I was 12. 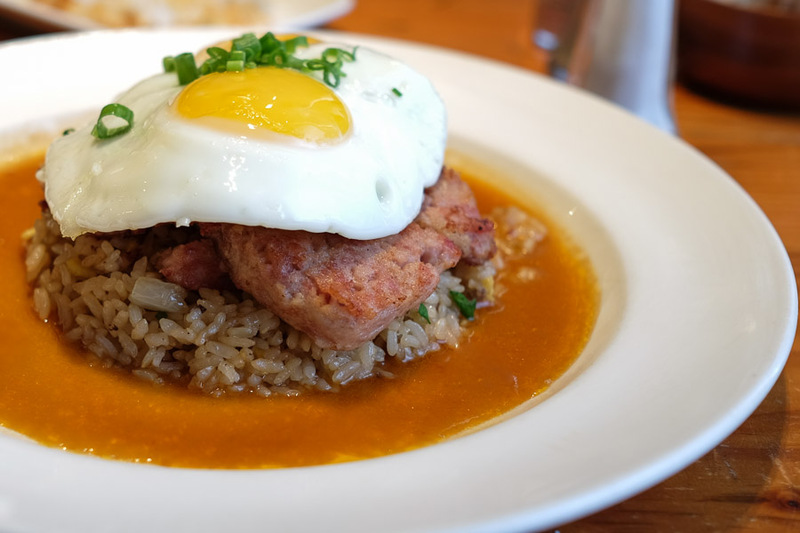 We made a booking for breakfast at Honolulu restaurant The Pineapple Room, where I had celebrity chef Alan Wong’s housemade SPAM, called Spong, served with kalua pig fried rice and two beautifully fried eggs. The Spong was delicious but its texture reminded me more of tinned corned beef than SPAM. I’d eat it again no worries, especially if accompanied by that porky fried rice, but for SPAM cravings, I’ll stick to the original. 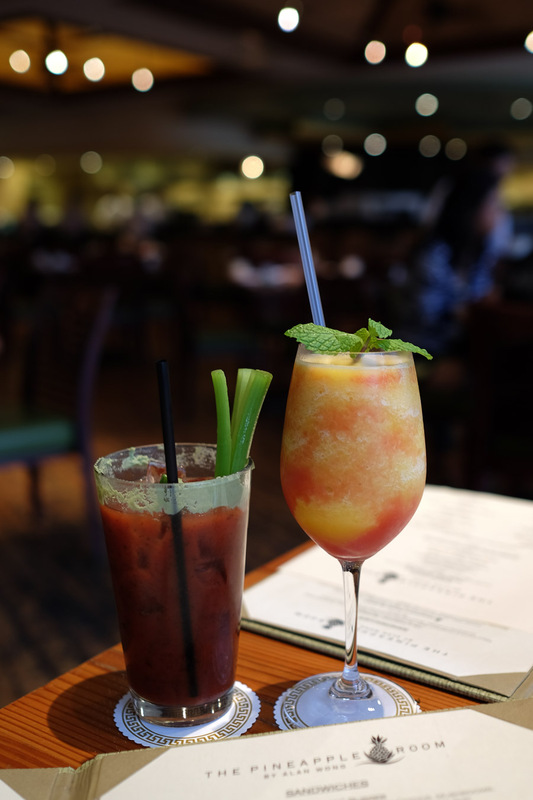 Jac’s ‘Wong Way’ Bloody Mary with ume paste, Li Hing Mui and wasabi rim (US$8.50), and my pretty Virgin Awamori Sunrise (US$6.75) – blended lilikoi (passionfruit), oranges and guava. My drink was delightful but the Bloody Mary was dominated by that wasabi rim. I’ve missed the McDonald’s Big Breakfast ever since they stopped serving them at McDonald’s in Australia. 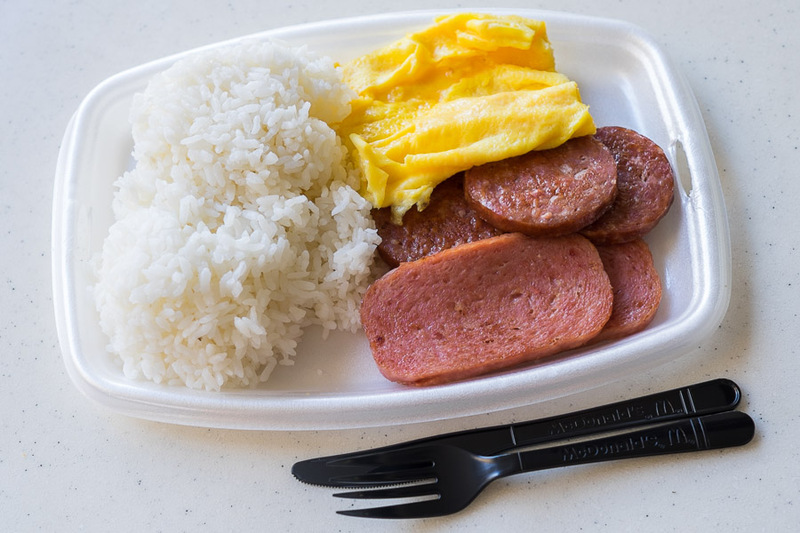 You can still get the Big Breakfast in the United States (served with a buttermilk biscuit instead of an English muffin as they did in Australia) and in Hawaii, there’s a local version with SPAM or Portuguese sausage with scrambled eggs and two scoops of rice. 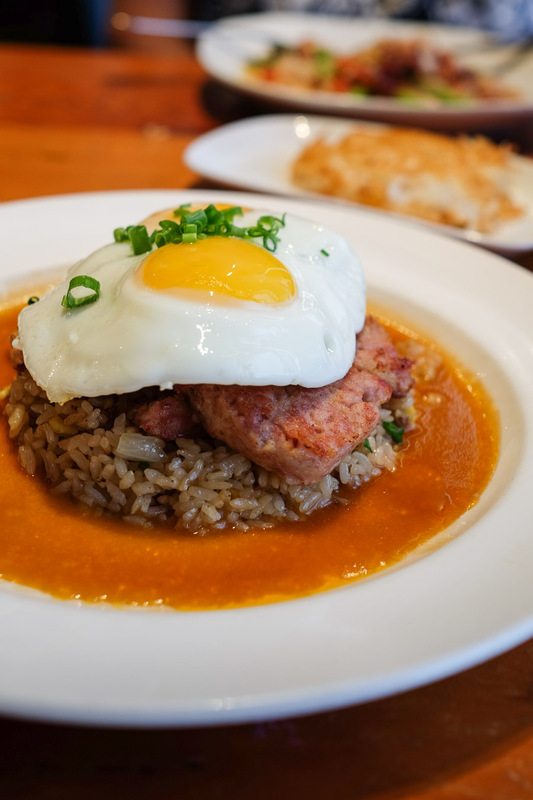 For us gluttons who want everything, there’s a ‘local deluxe breakfast’ with rice, eggs, SPAM and Portuguese sausage, which is what I had for breakfast on our last morning in Waikiki. I know I smiled the entire time eating this. 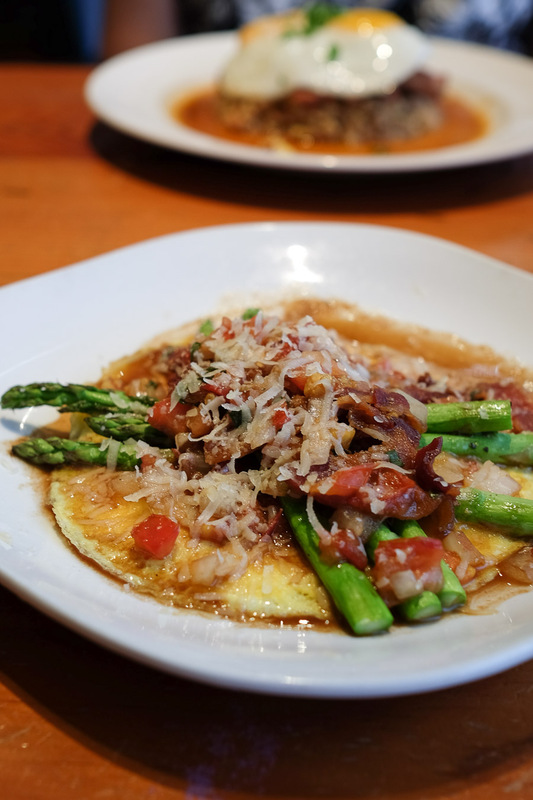 Comfort and nostalgia… and the magic of SPAM. I went to the United States twice last year – this is my first post about the second trip, in which Jac and I went to Hawaii (Oahu and Maui islands), Texas and Virginia. There’s a lot more to come. 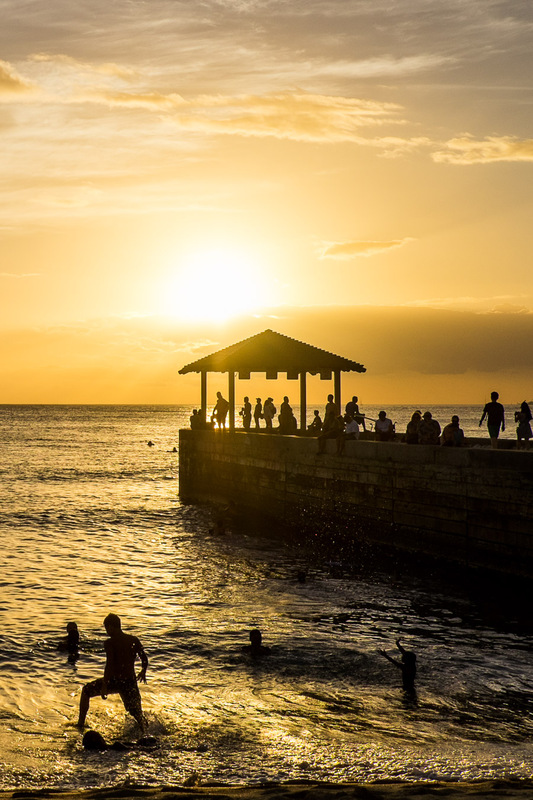 One of many gorgeous beach sunsets we enjoyed in Waikiki. If you haven’t already done so, you may like to check out my blog series about my first (solo) trip to the US, which included California, Wyoming and Colorado. 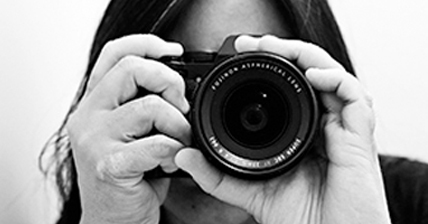 Start with the first post: Santa Paula, California USA. See more travel tales at my Travel page.